Easycare V Neck Linen Dress is rated 3.8 out of 5 by 9. 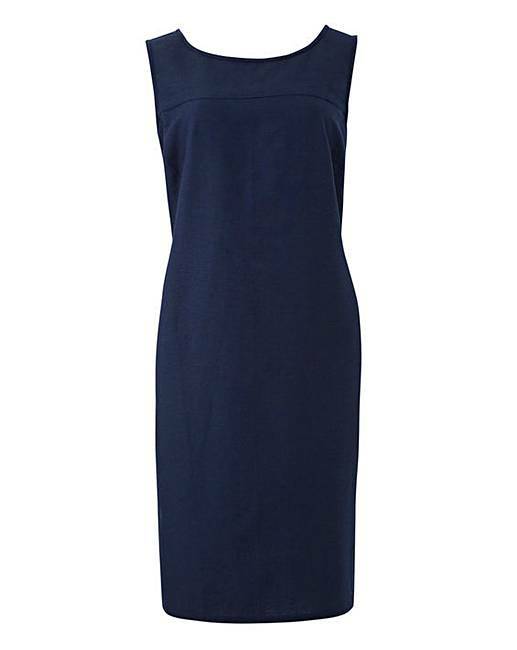 With summer just round the corner, the Navy Easycare V-Neck Linen Dress is a must-have for your SS19 wardrobe. Perfect for those sunnier days and warm evenings. With a breathable linen-blend fabric this sleeveless dress is cut to a relaxed shift shape creating a flattering fit. This dress will be a true summer wardrobe staple piece, just pair with some cute sandals and grab your shades to enjoy that sun in style! Rated 1 out of 5 by Bren 18 from None,didn't like material Didn't like it, sent back. Wasn't suitable. Didn't like material. Rated 4 out of 5 by Lindy04 from Gorgeous but not right for me This dress is stunning, very classy and stylishly simplistic. Sadly, it wasn't right for me - the size 16 was massive across the bust and under the arms and the size 14 was too snug on my tummy when I sat down (I usually wear a 14 bottom and a 16 top). Such a shame because it is a lovely dress, just not quite the right fit for me, but worth a try. Rated 5 out of 5 by Suse from Everyday outfit! I bought this about three weeks ago and it was a little on the small size so I bought another, I’ve kept the first one until I lose just a little more weight. I love it so much I’ve just bought another two! Rated 5 out of 5 by cancer24 from I sent this item back I sent this item back because it just didn't look good on as it was too big.